Elhaida Dani was born on 17 February 1993 in Shkodër, in north Albania. Music has always been her passion, but she never studied singing professionally. "I started to sing when I was 4 years old, all by myself, in my bedroom, for hours, entire afternoons. Every moment was filled with the company of song. I did not want to sing in front of other people, not even my mother…" Her parents understood how important her passion for music was; so they decided to send her to the Music School "Prenke Jakova" to study piano. But her real and deep passion was singing, but she kept it for herself. "I never talked about it with anyone. Even at the Music School no one had ever heard me sing…" At School Elhaida played the piano, the instrument she grew up with. As time went on, Elhaida's mother understood how important her passion for singing was. "One day my mom said to me "There is nothing I would like more than seeing you on a big stage singing. Because you can do it". That was the moment that everything started. For the first time I found the courage to look inside myself and see that this was what I wanted from life". From that time on, she changed her life to make her dream come true. She started appearing on national television in 2008, after participating in Kënga Magjike with her song "Fjala e fundit" (The last word). "From this moment on, I took part into many local concerts and cultural activities of the city. In 2009 I decided to take part into the talent show "Star Academy", where I won the first place and my career really started here". She then continued singing at various music competitions around the Balkans. When she was 18 she moved with her family to Tirana where she started studying Musicology in the "University of Arts" and started singing live with her band in the most important venues in Tirana. In 2011 she participated in "Sunčane Skale", held in Montenegro with "Si asnjëherë" (Like never before) and won the youth category of the show. Later that year, she won 3 awards in Bulgaria: "Best Singer" at "Zlaten Kesten" Festival in Petric, Grand Prix at "Nova Musica" in Gorna Oriahovitsa and Grand Prix of the "Sreberna Yantra" Festival, in Veliko Tarnovo. Her success continued in Romania with victories at VIII edition of the festival "George Grigoriu" in Braila, festival "Champions League", and Senior Trophy and the First Price in the National Festival "Mihai Traistariu". She also participated at the 50th edition of "Festivali i Këngës" with "Mijëra vjet" (Thousands of years). In early 2012, she worked with Threedots Music Albania, a popular music label and wrote "S'je më" (You're not the same anymore), and won one of the biggest Albania's music shows, "Top Fest", getting the title of "Best New Artist" as well. After seeking an international career and participating at many music competitions in the Balkan region, Dani decided to temporarily move to Rome, Italy to audition for the Italian version of The Voice. "In January 2013 I decided to follow my dream and I left my country and my family to take part into the Audition of the first edition of the talent show The Voice of Italy". She appeared on the "Blind auditions" with Jessie J's "Mamma Knows Best" and received a huge feedback from the jury, all the 4 coaches fought to have her in their team. Elhaida chose to enter Riccardo Cocciante team: "In Albania Riccardo is so famous, he's an icon of Italian music and I have grown up with his songs…my choice couldn't be different…". During the show she performed "No more tears", "All by myself", "Nessun dolore", "I believe I can fly", and "When love calls your name", the unpublished song written by Riccardo Cocciante for her. She also got opportunity to perform duets with her mentor Riccardo Cocciante and will.i.am. She advanced to the battles and knockouts and reached the finals in May 2013. She sang Lara Fabian's version of "Adagio" and won the show with over 70% of the public vote. On 2 July 2013 she released her first EP including some of the songs she performed during the Voice and 2 unreleased songs. EP has and entered Italian Top 30 chart, with video for single "Baciami e basta" (written for her by Francesco Silvestre, leader and singer of the pop-rock band Modà) reaching 800.000 views on Youtube. During 2013-14 she has been on tour throughout Italy, performing in top events and singing on the same stage together with Patti Smith, Elisa, Fiorella Mannoia, Dolores O'Riordan, Fausto Leali, Giovanni Allevi, Caro Emerald and many others. Elhaida has also shared the same stage as Jessie J for the Albanian Independence Day concert held in Tirana with 50,000 people attending. After success in Italy and major attendance at her Italian tour, Elhaida was considering applying for "Sanremo festival", however, preferred taking part in Albanian "Festivali i Këngës". Last year she performed at "Festivali i Këngës" as a special guest. Elhaida's favorite composer is Albanian maestro, Shpëtim Saraçi, with whom she worked with for three years at the show called "E djela shqiptare". She is big fan of "black" music, singers like: M.Jackson, W.Houston and Beyonce. She likes Albanian traditional food for its simplicity and her favourite Italian food is pasta. The withdrawal of the author of the song "Diell" that won the national selection, was a really unusual circumstance, followed by a race against time. However, Elhaida is confident in her new entry "I'm Alive" due to the international perspective that Albanian team has followed in the realisation of the new song: "we had an international audience always in mind and I hope the song will meet its expectations". Andri Xhahu for 4th year will be both commentator and spokesperson of Albania in the contest. Our next guest is the representative of Albania Elhaida Dani. As usual, we start off with asking what are her feelings about upcoming Eurovision participation. "I am very excited to represent my country in Eurovision. It's left only a month of time now and if I want to be honest I'm a little bit afraid, but can't wait to be in Vienna and sing my heart out on stage"
It wasn't the first time Elhaida competed in "Festivali i Kenges", but after gaining experience and popularity through "The Voice of Italy", she thinks that finally it was the right moment to become part of the big Eurovision Song Contest event. Not everything though went right after the victory in the festival. "I learned in late February that the song "Diell" with which I competed at the national preselection and won with, was withdrawn by songwriter and wasn't going to the ESC anymore, and at the time I thought that neither I myself will be going to be part of Eurovision. But then the director of the FiK called to let me know that I still have the possibility to start creating a new song for the contest, and of course I was very happy to know that". The work for the song "Diell" was discontinued, but Elhaida managed to get a new track ready in time. Now she will be competing at Eurovision with "I'm Alive", which she describes as "strong and emotional song. What I really wanted from the beginning. As soon as I knew that I wont be able to go to Eurovision with the song Diell I started looking for a new song. My brother talked me about these two young composers, ZzapnChriss, and the very next day I was in Kosovo, and started creating and recording the new song immediately". Elhaida informs that the Albanian version of the song is already ready, and the video will be released in May and they are still working on an Italian version of the song. Speaking on the staging of her performance for Vienna, Elhaida says: "We are still working on the staging, with the Rtsh and Provideo. I want to keep it simple but strong". On the stage she will be joined by Olsa Papandili and Erga Halilaj, same backing vocalists who performed with Hersi Matmuja last year. "Miranda Dubi is the stylist who created the look for the music video of "I'm alive", and she will be taking care of my look in Eurovision too". Music video for the contest entry has been already presented and Elhaida says "We wanted to keep the video simple but still giving a good message. In the video you see sad woman as a policegirl, firegirl, doctor, but at the end of the video their tears go in forward, because they are strong and don't cry". 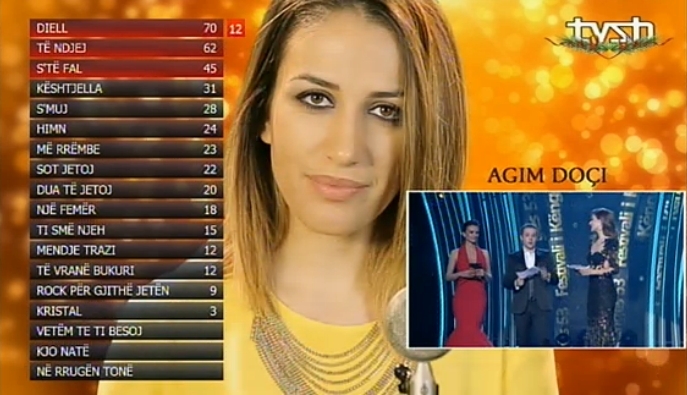 Albanian entrant stays that her aim at the international contest is first of all "to enjoy the big stage and have fun". Next week she will be making her appearance at the Eurovision In Concert in Amsterdam, she will also visit Athens, Hungary and several other countries in her promotional tour. "I've heard already a lot of the other countries songs, I can say that all the songs and artists are very good and it will be a pleasure to be sharing the stage with them". Currently, Elhaida is also serving as the coach of Talent Show "Chance" aired on the Italian Television "Agon Channel". "It is a very good experience because it is the first time that I am at the other part of the medal, being a judge and not being a contestant. Also I'm working on a new song that will be released after Eurovision". Besides Italian version of "I'm Alive" and a new song Italian fans can expect a summer tour of Elhaida Dani in their country. "I want to thank everybody for the support and the messages. Hope to meet you in Vienna this May. ❤ "
You can read complete text version of this interview on OGAE Rest of the World Facebook page. Elhaida toured around Macedonia on 27 and 28 April to promote her Eurovision entry. She had been guest in Skopje, Gostivar and Tetova, welcomed by local municipalities, universities and public institutions. Here you can find a little bit more about her Macedonia Tour: Interview in Skopje: Bardh e Zi; Televizioni Koha Tetovë; Televizioni Globi Gostivar. The Albanian version of #ImAlive will be released Saturday, May 2nd. Premiere during the TVSH News Edition at 8:00 pm and release on RTSH Youtube Channel and Eurovision official website. On April, Monday 27 and Tuesday 28 Elhaida will visit and perform in Macedonia, where she has been invited by the national TV MKTV, the Municipality of Tetovo, the University of the State of Tetovo and the University SEEU (where she already performed in 2014). In the two-day promo tour in Macedonia, Elhaida will have the opportunity to meet the Mayor of Tetovo Teuta Arifi and the Deans and Students of the two major Universities of Macedonia, presenting her Eurovision entry #ImAlive and sharing her experience about the world’s most famous music contest. Shots from an exciting weekend :) thank you Amsterdam and Eurovision in Concert ! Ágústa Eva, who competed as Silvia Night in Eurovision Song Contest 2006 has covered Eurovision 2015 entry of Albania in special edition of Eurovísir weekly podcast show on Visir.is website. Besides vocals and backing vocals she also herself played guitar, violin and bongo drums in the recording. Listen to all episodes of the program here. 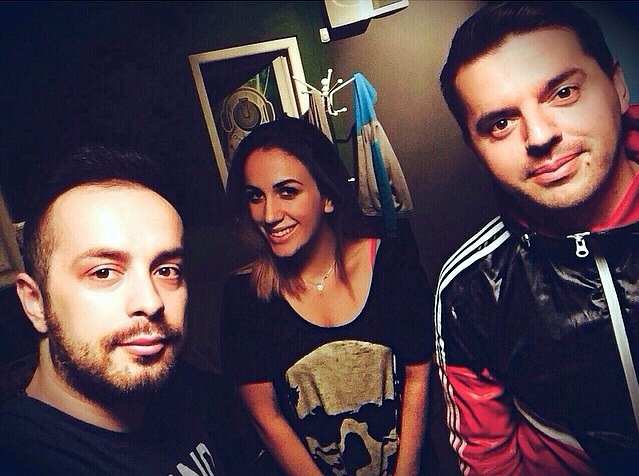 Elhaida Dani is working on the music video for the entry that will represent Albania at Eurovision 2015. The music video is produced by Edlira Bahollit and ProVideos. The song is expected to premiere on March 15. Diell was composed by Aldo Shllaku, who has composed several soundtracks for blockbuster movies and worked in the remake of the 2012 Albanian entry which earned a top 5 spot in Baku, with lyrics penned by Viola Trebicka and Sokol Marsi, who is also responsible for the 2011 Albanian entry in the Eurovision Song Contest, "Feel the passion". The song was a pop ballad with clear retro influences that make it sound like a 90′s salon music piece. As the song expanded so did Elhaida's vocal range as she plays with her voice in the high notes. The song at it's national final version was approximately one minute longer than Eurovision limit. Earlier, Elhaida said: "The song will be completely transformed, it will be the same song but we will work to make it sound even better. Me and Aldo didn't work on this version a lot as he lives in Los Angeles and I live in Italy so we only got together twice but the song will definitely undergo some change. I want it to be in English as that is the only way everyone will understand it". Local Albanian press claims that there was copyright dispute and "Diell" composer Aldo Shllaku has refused to pass complete rights on the song to RTSH. The demand for withdrawal of the song was made on 5 February. Aldo Shllaku explained the decision saying that RTSH has intervened in the song composed by him. "Despite the insistence to find out, I still have no idea to whom and how are transferred rights of composer, lyricist, arranger of the winning song for the changes that should be done for the Eurovision. This is a flagrant violation of any copyright, professional ethics and a decision based on nonsense", said Shllaku. He says it is unprecedented case that not only the songwriter was not given the basic right to work on his song, but rather, songwriters have been excluded from any process since 28 December. Composer says that in such a situation, beyond any time limit for having an opportunity to work on the song, there was no other choice but to pull the song. "I can not undertake professional responsibilities when I'm not professionally engaged myself. Every step of the work on the song that has not been authorized by the authors is in breach of their copyrights". A new entry titled "I'm Alive" is written by well-known production duo ZzapnChriss (Arber Elshani and Chris Lekaj) from Pristina on lyrics of Sokol Marsi. They were also behind entry of Lindita Halimi "S'të fal", which finished 3rd at this year's FiK. According to Elhaida a new song will be pop ballad, different in style from "Diell". The song is said to be completed in couple of days time, and the music video for the new entry will also be produced shortly. Elhaida Dani has confirmed once again the she will perform her entry at Eurovision in English language. Speaking at "Prive show" on Klan Kosova TV Dani informed that the new version of the song is being recorded in Los Angeles, where lives composer Aldo Shllaku, and where Dani herself will travel shortly. Singer has also informed that she has just signed a contract to get on a judging panel of a talent show in Italy, reports lapsi.al. On 12 February Elhaida will perform during one of the most exciting event in the world, Carnival of Venice in the magic scenario of Gran Teatro di Piazza San Marco. 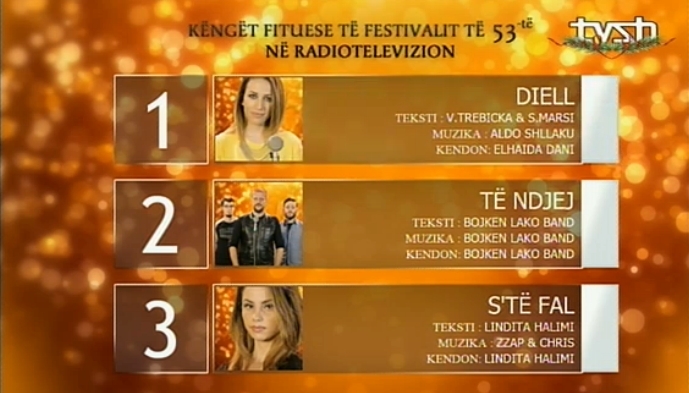 "Festivali i Këngës" once again served as the preselection for Eurovision Song Contest in Albania. 53rd edition of Festivali was held at the Palace of Congress in Tirana, hosted by Turjan Hyska, Floriana Garo & Liberta Spahiu. The artistic director of the show is Shpetim Saraçi, the screenwriter is Mira Tuci. Interested artists and composers were able to submit their entries on 14-15 October 2014. All songwriters and artists must have had Albanian citizenship and all songs must be 100% in the Albanian language. Around 50 entries were received. 28 competing songs and artists were announced on 30 October 2014. Among them: Erga Halilaj was one of the backing vocalists of Hersi in the 2014 Eurovision Song Contest, and Klajdi Musabelliu backed Anjeza Shahini in Istanbul in 2004. Enver Petrovci hosted the Yugoslav national final in 1986, when it was held in the Boro i Ramiz Hall in Prishtina, the capital of Kosovo. The lyrics of Rezarta Smaja's song Më rrëmbe were written by late Dr. Flori, who had previously written the lyrics to "Zjarr e ftohtë", the Albanian entry in the 2006 Eurovision Song Contest. The pop jury handed out a special prize in the end of the show - it went to the band Offchestra, one of the semifinalists, who then went on to perform their song Bajram once again. Gjergj Leka received the prize for the best interpretation. In the interval act, Rona Nishliu, Albanian 2012 Eurovision Song Contest representative, performed. Earlier invited Eurovision 2009 winner Alexander Rybak, after managed by him act failed to win in the Belarus national preselection, has withdrawn from the performance. Эльхаида Дани (Elhaida Dani) родилась 17 февраля 1993 года в городе Шкодер в северной Албании. Музыкой девочка начала интересоваться с раннего детства, но она никогда не занималась пением профессионально. "Я начала петь, когда мне было 4 года, сама, в спальне, часами, целыми днями. Каждый момент в моей жизни был наполнен музыкой. В то время я боялась и не хотела еще петь перед другими людьми, даже собственной мамой". Однако, ее родители вовремя поняли, как важна музыка для ребенка, и решили отправить ее заниматься в музыкальную школу "Пренке Якова", чтобы заниматься фортепиано. Но ее главным интересом продолжало оставаться пение, хоть и держала она этот интерес внутри себя. "Я никогда ни с кем это не обсуждала. Даже в музыкальной школе никто не слышал, как я пою…". В школе Эльхаида играла на фортепиано, инструменте с которым она выросла. Шло время, и мама Эльхаиды поняла, что ребенок мечтает о пении. "Однажды она сказала мне: “Я не мечтаю ни о чем большим, чем увидеть тебя поющей на большой сцене. Я верю, что ты сможешь добиться этого”. И в этот момент все и началось. Тогда я впервые нашла храбрость заглянуть внутрь себя, и понять, чего я хотела от жизни". С того времени, Эльхаида изменила свою жизнь, чтобы постараться добиться своей большой мечты. В 2008 году Эльхаида принимает участие в популярном фестивале Kënga Magjike с песней "Fjala e fundit". "С этого момента я принимала участие во многих местных концертах и мероприятиях. В 2009 году я решила попробовать себя в шоу молодых талантов "Star Academy", где завоевала первое место, и это стало настоящим стартом моей карьеры". С того момента она продолжила выступать на различных музыкальных конкурсах по всем Балканам. Когда Эльхаиде было 18 лет, ее семья перебралась в Тирану, где она поступила в "Университет искусств", факультет музыковедения, а также стала выступать со своей группой на различных площадках Тираны. В 2011 году Эльхаида принимает участие в черногорском фестивале "Sunčane Skale", где с композицией "Si asnjëherë" (Как никогда раньше) побеждает в молодежной категории шоу. Позднее в том же году она завоевывает три награды в Болгарии: "Лучшей певице" на фестивале "Златен Кестен" в Петриче, Гран-при на фестивале "Нова Музика" в Горна-Оряховице и Гран-При фестиваля "Среберна Янтра" в Велико Тарново. Ее успех повторился и в Румынии, где она одержала победы на VIII фестивале "Георге Григориу" в Брэиле, фестивале "Лига чемпионов" и первое место на национальном фестивале Михая Трайстариу. Также она выступила на 50м фестивале "Festivali i Këngës" в родной Албании, где вышла в финал с композицией "Mijëra vjet" (Тысячи лет). В начале 2012 года она, сотрудничая с компанией Threedots Music Albania, написал композицию "S'je më" (Ты больше не такой), и одержала победу на одном из крупнейших албанских музыкальных шоу - фестивале "Top Fest", где также получила приз "Лучшему новому исполнителю". После попыток начать международную карьеру посредством участия в музыкальных конкурсах по всему балканскому региону, Дани решает временно перебраться в Рим, и попробовать пройти там прослушивание на участие в итальянской версии шоу "Голос". "В январе 2013 моя мечта повела меня за пределы своей страны, я оставила свою семью, чтобы попробовать попасть в первый сезон нового шоу талантов "Голос Италии". В слепых прослушиваниях Эльхаида исполняет композицию Jessie J. "Mamma Knows Best" и все четыре члена жюри борятся за право видеть Дани в своей команде. Она же остановила свой выбор на Рикардо Коччианте: "В Албании Рикардо настолько знаменит, он - настоящая икона итальянской музыки, я выросла на его песнях, потому мой выбор просто не мог и быть иным…". Во время шоу она исполняла такие песни, как "No more tears", "All by myself", "Nessun dolore", "I believe I can fly", и "When love calls your name", ранее неопубликованную песню, написанную Коччианте специально для нее. Также она получила возможность исполнить дуэты со своим ментором Риккардо Коччианте и певцом will.i.am. Она прошла через все стадии шоу и в мае 2013 года вышла в его финал. Там, исполнив версию песни "Adagio" Лары Фабиан, она одержала сокрушительную победу, набрав свыше 70% голосов телезрителей. 2го июля 2013 года она выпустила свой первый EP-диск, на который вошли некоторые из песен, которые она исполнила на проекте "Голос" и две ранее неопубликованные песни. EP вошла в топ 30 чарта Италии, а видео на сингл "Baciami e basta" (написанный для Эльхаиды Франческо Сильвестри, солистом и лидером поп-рок группы Modà) собрал свыше 800.000 просмотров на Youtube. В 2013-14 годах Эльхаида гастролирует по Италии, выступая на крупнейших мероприятиях, на одной сцене с такими звездами как Патти Смит, Элиза, Фиорелла Маннойя, Долорес О'Риордан, Фаусто Леали, Джованни Аллеви, Каро Эмеральд и многими другими. Эльхаида также выступила на одной сцене с Jessie J. во время концерта в честь Дня независимости Албании, прошедшем в Тиране, который посетили 50 тысяч человек. После большого успеха в Италии, огромного количества зрителей, посетивших ее выступлений по всей стране, Эльхаида рассматривала возможность подачи заявки на участие в фестивале Сан-Ремо, однако, в итоге предпочла выступить вновь на крупнейшем албанском фестивале "Festivali i Këngës". В прошлом году она также выступила на нем, но только в качестве специальной гостьи. Любимым композитором Эльхаиды является итальянский маэстро Шпетим Сарачи, с которым она работала на протяжении трех лет в шоу "E djela shqiptare". Она является большой поклонницей "черной" музыки, и исполнителей, таких как Майкл Джексон, Уитни Хьюстон и Бейонсе. Также она является поклонницей албанской кухни за ее простоту, а из итальянской кухни ее любимым блюдом является паста. Отказ автора песни "Diell", победившей в национальном отборе, от участия песни в международном Евровидении, был очень необычным обстоятельством, за которым последовала борьба со временем. Однако, Эльхаида уверена в своей новой песней "I'm Alive" из-за международной перспективы, которой команда Албании руководствовалась при ее написании: "мы изначально думали о том, как песню воспримут зарубежные зрители, и, надеюсь, что она будет соответствовать их ожиданиям". Андри Джаху в 4й год подряд станет комментатором и глашатаем Албании. Наша следующая гостья - представительница Албании Эльхаида Дани. Как обычно, мы начинаем наше интервью с вопросам о чувствах, которые испытывает участник при приближении конкурса Евровидение. "Я очень рада возможности представлять свою страну на Евровидении. Остался всего один месяц времени, и, если я буду честна, то я немного боюсь, но с нетерпением жду поездки в Вену и готовлюсь петь на сцене от всего своего сердца"
Эльхаида уже не в первый раз принимала участие в "Festivali i Kenges", но, после получения опыта и повышения ее популярности после победы в итальянском "Голосе", она считает, что пришло, наконец, подходящее время для того, чтобы выступить на таком крупном мероприятии, как Евровидение. Но после победы на национальном фестивале не все пошло так, как задумывалось. "В конце февраля я узнала о том, что песня "Diell", с которой я выступала и победила на национальном отборе, была отозвана ее автором и больше не могла принимать участие в Евровидение. В тот момент я думала, что и я сама уже туда не поеду. Но потом мне позвонил директор албанского фестиваля, и сказал, что у меня есть возможность создать новую песню для конкурса. Конечно же, я была очень рада услышать это". Работа над "Diell" была прервана, но Эльхаиде удалось своевременно подготовить новый трек. Теперь она выступит на Евровидении с песней "I'm Alive", которую она описывает, как "сильную и эмоциональную песню. Именно то, чего я и хотела с самого начала. Как только я узнала, что не смогу поехать на Евровидение с Diell, я начала поиски новой песни. Мой брат рассказал мне об этих двух молодых композиторах, ZzapnChriss, и на следующий день я уже была в Косово, где мы начали создание и запись новой песни". Эльхаида рассказывает, что албанская версия ее песни уже тоже записана, и видеоклип на нее будет представлен в мае. В настоящее время идет работа над записью версии песни на итальянском языке. Рассказывая о своих планах по постановке выступления в Вене, Эльхаида говорит: "Мы все еще работаем вместе над постановкой, телеканал RTSH и компаний Provideo. Я хочу, чтобы она оставалась простой, но в то же время мощной". На сцене со ней вместе выступят Олса Папандили и Эрга Халилай - те же самые бэк-вокалистки, что пели и с Херси Матмуйей в прошлом году. "Миранда Дуби - стилист, которая создавала мой образ для видеоклипа на песню "I'm alive", также будет работать над моим имиджем и на сцене Евровидения". Уже представлен видеоклип на конкурсную песню, и Эльхаида рассказывает, что "Мы хотели, чтобы он также был простым, но в то же время нес в себе позитивный посыл. В нем вы можете видеть образ печальных женщин: полицейской, пожарной, доктора, но в конце-концов их слезы поднимаются обратно, они становятся сильными и больше не плачут". Представительница Албании рассказывает о том, что ее цель в международном конкурсе прежде всего "получить удовольствие от выступления на большой сцене". На следующей неделе она примет участие в Eurovision In Concert в Амстердаме, далее она посетит Афины, Венгрию и еще ряд стран. "Я уже слышала множество песен других стран, мне кажется, что все артисты и исполнители в этом году очень сильные, и для меня будет большим удовольствием разделить сцену вместе с ними". В настоящее время Эльхаида также является одним из педагогов шоу талантов "Chance", выходящего на итальянском телеканале "Agon Channel". "Для меня - это очень хороший опыт, потому что впервые я нахожусь по другую сторону, я сужу участников, а не выступаю в качестве участницы сама. Также я работаю над песней, которая будет выпущена уже после Евровидения". Помимо итальянской версии песни "I'm Alive" и новой песни ее итальянские поклонники могут ожидать летнего тура Эльхаиды Дани в их стране. "Я хочу поблагодарить всех за их поддержку и те письма, которые я получаю. Надеюсь встретиться со всеми вами в Вене в мае. ❤ "
С полной текстовой версией интервью (на английском языке) вы можете познакомиться на странице ОГАЕ Остальной мир в Facebook. Как мы и сообщали, 27 и 28 апреля Эльхаида Дани побывала в Македонии с продвижением своей песни. Она побывала в Скопье, Гостиваре и Тетове, где ее поприветствовали местные муниципалитеты, университеты и общественные институты. Узнать подробнее о поездке Эльхаиды в Македонию можно из: Интервью в Скопье: Bardh e Zi; Televizioni Koha Tetovë; Televizioni Globi Gostivar. Албанская версия песни I'm Alive будет выпущена в субботу, 2го мая. Премьера пройдет во время новостей телеканала TVSH в 20:00, а также на телеканале RTSH на Youtube и официальном сайте Евровидения. 27го апреля, в понедельник и 28го апреля, во вторник, Эльхаида побывает в Македонии, куда она была приглашена национальным ТВ Македонии MKTV, муниципалитетом города Тетово, университетом Тетово и университетом SEEU (где она уже выступала в 2014 году). За два дня своего пребывания в Македонии, у Эльхаиды будет возможность встретиться с мэром Тетово Теутой Арифи, деканатом и студентами двух крупнейших университетов Македонии, представить свю песню #ImAlive и поделиться своим мнением от участия в знаменитом конкурсе. Агуста Ева, выступавшая на конкурсе Евровидение 2006 под именем Сильвии Найт, перепела конкурсную песню Албании Евровидения 2015 "I'm Alive" в одном из выпусков еженедельного подкаст шоу Eurovísir, выходящего на вебсайте Visir.is. Помимо лид и бэк-вокалов, Агуста также сама сыграла на гитаре, скрипке и барабанах бонго на записи. Все выпуски программы можно услышать здесь. Эльхаида Дани работает над видеоклипом на песню, которая представит Албанию на Евровилении 2015. Видеоклип снимают Эльдира Бахоллит и команда ProVideos. Премьера песни ожидается 15 марта. "В этом году Албания не будет представлена на Евровидении с песней, выбранной в качестве победителя FiK в декабре прошлого года. Автор песни "Diell" по личным причинам, которые не могут быть преодолены, принял решение снять свою песню с конкурса. Совместно с телеканалом RTSH было принято решение, уважающее мнение композитора и правила Евровидения, что я, как победительница FiK, должна буду представить свою страну в Вене с новой песней. Мое главное желание сейчас заключается в том, чтобы эта новость не принесла недовольство и разногласия, а нашей общей целью остается добиться для Албании как можно лучшего результата на конкурсе, и мы будем продолжать усиленно работать над ее достижением"
Автором песни "Diell" (Солнце) являлся композитор Алдо Шллаку, который также написал ряд саундтреков к кинофильмам и работал, помимо прочего, над ремейком песни Албании для Евровидения 2012 в Баку, где она в итоге заняла место в первой пятерке Текст написали Виола Требицка и Сокол Марси, который также был автором песни Албании для Евровидения 2011 "Feel The Passion". Песня "Diell" представляет собой поп-балладу с очевидными ретро влияниями, которые делают ее по звучанию напоминающей салонную музыку 90х годов. По мере расширения, песня позволяла Эльхаиде продемонстрировать свой широкий вокальный уровень, где она играла своим голосом на самых высоких нотах. В версии, прозвучавшей на национальном отборе песня звучала примерно на минуту дольше допустимого для Евровидения лимита. Ранее Эльхаида говорила следующее: "Песня будет полностью переработана, это будет та же самая песня, но она зазвучит еще лучше. У нас с Алдо было не так много времени поработать над этой первой версией, поскольку он живет в Лос-Анджелесе, а я живу в Италии, поэтому нам удалось встретиться всего дважды, но теперь песня, несомненно будет подвергнута изменениям. Также я хочу, чтобы она прозвучала на английском языке, что позволит наибольшему возможному количеству зрителей понять ее". По сообщениям местной албанской прессы, возник вопрос о правах на песню "Diell", и ее композитор Алдо Шллаку отказался передавать полные права на свою песню телевидению Албании RTSH. Требование снятия песни с конкурса было отправлено им 5го февраля. Шллаку объяснил это решение тем, что RTSH вмешивалось в процесс переработки песни, написанной им. "Несмотря на свою настойчивость, я так и не понял, кому и как передаются права композитора, автора тексты, аранжировки на победившую песню, для внесения в нее изменений, необходимых для Евровидения. Это откровенное нарушение всех авторских прав, профессиональной этики и просто глупое решение", говорит Шллаку. Он говорит, что то, что автору не было дано право доработать свою песню к конкурсу - это полностью беспрецедентный случай, более того, авторы были исключены из любого творческого процесса после 28 декабря, окончания национального отбора. Композитор считает, что в данной ситуации, когда до нормальной работы над песней уже не остается достаточно времени, у него не осталось иного выхода, кроме как отозвать ее с конкурса. "Я не могу брать на себя профессиональную ответственность за процесс, в котором я сам не принимаю никакого участия. Каждый шаг работы над песней, который не был обговорен с ее авторами, является прямым нарушением их авторских прав". Авторами новой песни для Эльхаиды, которая, как сообщается, носит название "I'm Alive" стали известный продюсерский дуэт ZzapnChriss (Арбер Элшани и Крис Лекай) из Приштины, Косово и поэт-песенник Сокол Марси. В этом году ZzapnChriss также являлись авторами песни Линдиты Халими "S'të fal", занявшей на FiK третье место. По словам Эльхаиды новая песня будет поп балладой и отличаться по стилистике от "Diell". Ожидается, что новая композиция будет готова в ближайшие пару дней, а сразу после этого пройдут съемки видеоклипа на нее. Эльхаида Дани вновь подтвердила, что исполнит свою конкурсную песню на Евровидении на английском языке. В интервью "Prive show" на телеканале Klan Kosova Дани рассказала, что запись новой версии песни проходит в Лос-Анджелесе, где живет ее композитор Алдо Шллаку, и куда скоро направится и сама Дани. Певица также рассказала, что подписала контракт, и в ближайшем будущем примет участие в одном из популярных итальянских телешоу по поиску молодых талантов в качестве члена жюри. 12го февраля Эльхаида выступит в рамках одного из самых захватывающих мероприятий мира, Венецианского Карнавала, который пройдет в Gran Teatro di Piazza San Marco. Крупнейший национальный фестиваль "Festivali i Këngës" в очередной раз послужил албанским отбором на конкурс Евровидение. 53й выпуск фестиваля прошел во Дворце конгрессов в Тиране. Ведущими шоу выступили Турьян Хюска, Флориана Гаро и Либерта Спахиу. Арт-директором фестиваля был Шпетим Сарачи, а автором сценария фестиваля - Мира Туци. Прием заявок от заинтересованных артистов и композиторов осуществлялся 14-15 октября 2014 года. Все авторы и артисты должны были иметь албанское гражданство, а участвующие песни полностью исполняться на албанском языке. Всего было получено около 50 заявок. 28 выбранных песен и их исполнители были объявлены 30го октября 2014 года. Среди них: Эрга Халилай, которая была бэк-вокалисткой Херси Матмуйи на Евровидении 2014, Клайди Мусабеллиу, который выступал с Аньезой Шахини в Стамбуле в 2004. Энвер Петровци был ведущим национального отбора Югославии в 1986 году, когда он проходил в зале Boro i Ramiz в Приштине, столице Косово. Автором текста для песни Резарты Смайи "Më rrëmbe" был недавно скончавшийся исполнитель Dr. Flori, который также был автором текста песни "Zjarr e ftohtë" с Евровидения 2006 года. Поп-жюри вручило специальный приз в конце шоу - его обладателями стала группа Offchestra, выступавшая в полуфинале шоу, которая вновь исполнила свою композицию "Bajram". Гьергь Лека получил приз за лучшее исполнение конкурсной песни. В интервал акте выступила представительница Албании на Евровидении 2012 Рона Нишлиу. Ранее приглашенный в качестве гостя победитель Евровидения 2009 Александр Рыбак, после неудачи продюсируемого им коллектива на национальном отборе Беларуси, отказался от выступления. Смогу ли я когда-либо залечить эти болезненные шрамы? Где ты? Где? Малыш, неужели ты не вернешься? You're the one, you live in me. And in the moment when my eyes can't see you. That's what you are to me, a bright light. To live a life with you. You are my sun and don't you ever let me go. Ты тот единственный, ты живешь во мне. И в тот момент, когда мои глаза не видят тебя. Это то, чем ты являешься для меня - ярким светом. Чтобы прожить жизнь с тобой. Ты - мое солнце, и никогда не отпускай меня.